We’ve finally reached that point where an announcement of Apple’s next-generation iPhone hardware is close enough for leaks and reveals to start filtering through from supply chain partners. One of the most significant to date is coming courtesy of Steve Hemmerstoffer and shows a video which purports to be a hands-on experience with two dummy units depicting two of Apple’s 2018 iPhone lineup. This latest leak and push into the public domain comes just a couple of days after another leaker by the name of Ben Geskin, published a number of static images which show very similar units said to be of non-functional dummy units of the larger 6.5-inch iPhone X Plus and the smaller 6.1-inch iPhone with an LCD display. Rather than having a flat look at two dummy units from still images, this latest share gives a great video-based look at the two units side-by-side and immediately gives a visual understanding of the size differences between two of Apple’s three planned devices due for launch later this year. Visually speaking, there aren’t a ton of differences from what we have been expecting. The single lens on the 6.1-inch LCD model is clearly visible and is shown protruding from the back of the device. The same can be said for the larger 6.5-inch iPhone X Plus which clearly shows the larger dual-lens camera poking out from the back of the gorgeous chassis. Both devices also have a visible shiny frame around the outside, with speculation suggesting that Apple will be using a steel frame on the iPhone X Plus and an aluminum frame on the smaller 6.1-inch model. This will likely be a cost-saving measure to try and keep the price of the LCD model as low as possible. Interestingly, we aren’t getting a look at the potential new colors of the devices with these dummy units. 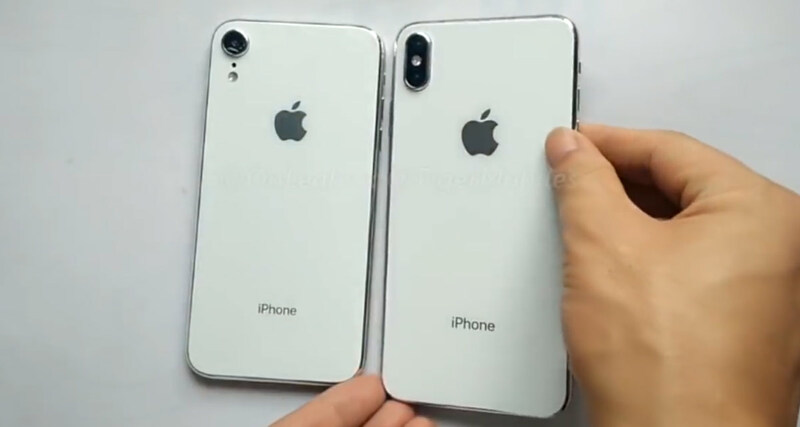 Both of the units shown in the video have white rears, and as gorgeous as they do look, it’s definitely not the red, blue, or orange that has been predicted to be available when the devices launch later this year. Due to the dumb nature of these units, we can’t get a look at iOS 12 working on the device but we’re sure it’s only a matter of time until we see some prototype units coming into the public domain. Aren’t these marketed much like cars? Shouldn’t this be the 2019 lineup? 2018 is more than half over. Finally someone else notices this!